Following the success of the event in 2017, this year UnLtd, the media, marketing and creative industry’s social purpose organisation will be taking over an entire prison – just for Adland. 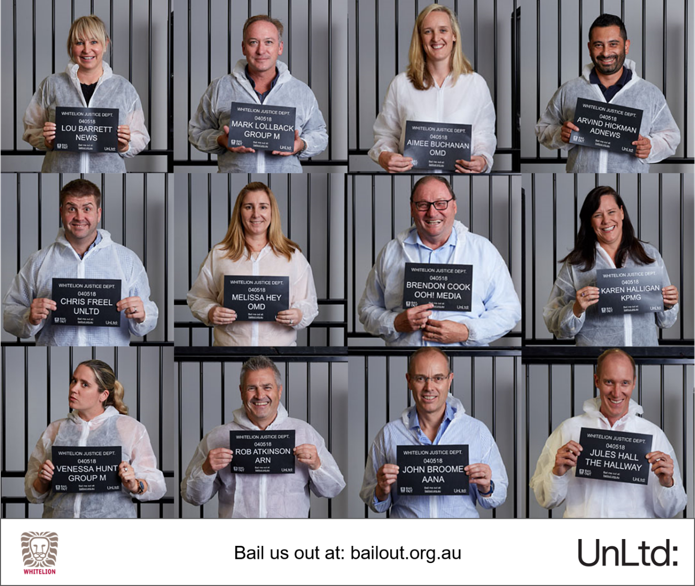 The inmates being locked up include: Mark Lollback, GroupM; Lou Barrett, News; Danny Bass, IPG; Aimee Buchanan, OMD; Will Easton, Facebook; Kim Portrate, ThinkTV, Emily Perrett, Clemenger BBDO; John Broome, AANA; Mark Frain, MCN; Rob Atkinson, ARN; Andrew Little, DDB; Jules Hall, The Hallway; Sophie Madden, MFA; Peter Horgan, Omnicom Group and 40 other senior leaders. This year, the inmates will be split into four gangs – Media Owners Gang, Creative Gang, Tech Gang and Media Agency Gang, all competing to raise the most funds for Whitelion. To help support your favourite industry personality or gang, head online to contribute towards their bail and support the Media Owner Gang, Creative Gang, Tech Gang or Media Agency Gang. Bail Out is a national campaign for Whitelion, providing a unique opportunity to step into the shoes of a young person that has been disconnected from our community due to abuse and neglect, drug addiction and poverty. The event exposes ‘inmates’ to life on the inside – they will be stripped of possessions, fingerprinted, photographed and subjected to interrogation before spending the night behind bars. Whitelion is a charity that connects at risk young people with the community to educate them to make positive and often life changing choices through practical and effective support such as mentoring programs, education and employment. To donate:Media Owner Gang, Creative Gang, Tech Gang or Media Agency Gang.